Part 1 The global retail industry: New trends in the global retail industry; The characteristics of successful retailer models; Case study: the Internationalization of Wal-Mart. Part 2 The revolution of Chinese retailing: The history of Chinese retailing; The opening-up of Chinese retailing; The real face of Chinese retailing; Chinese consumer revolution. 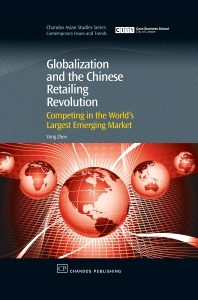 Part 3 Competing Chinese retailing: Entering the world’s largest emerging market; The success and failure of global retailers in China; Chinese retailers’ behaviour; Competition between foreign and Chinese retailers in China. Part 4 WTO and Chinese retailing: WTO: a great opportunity to fail or succeed? Conclusions. Chinese retailing serves 1.3 billion consumers and is developing with high economic growth rates. This detailed reference examines the following issues: the revolution happening in Chinese retailing; the evolution of the opening-up policy of Chinese retailing; the great opportunities brought about by the dramatic change in the Chinese retail industry particularly by China's entry to the World Trade Organisation (WTO); how to succeed in the Chinese retail market; successful models and strategies for both Chinese retailers and multinational retailers in China. The book also discusses the deep impact of China's entry to the WTO on the Chinese retail industry and the strategic importance of the industry in China's transitional economy. Dr Yong Zhen is an Assistant Professor of Business and Management at Beijing Normal University, Hong Kong Baptist University United International College. He has over 10 years of work and research experiences in Chinese retailing. He studied in the USA and the UK; and obtained Ph. D degree from University of Cambridge.